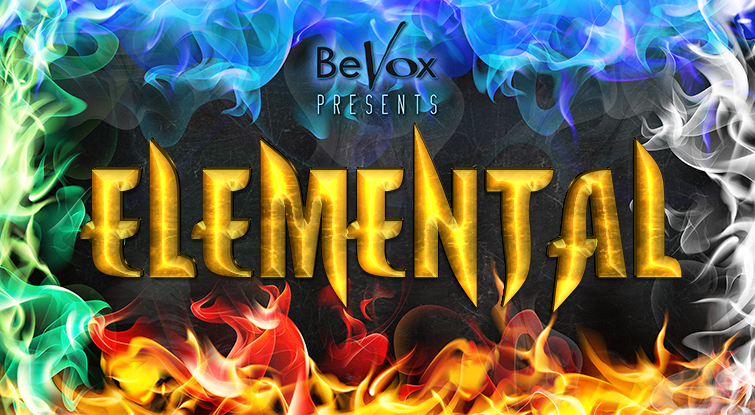 For about the last year, Toni and I have been planning “Elemental”, our ground-breaking, multi-sensory themed concert experience. Since the beginning of the year, hundreds of BeVox singers have been working on the music. Countless hundreds of hours have been spent on the staging, lighting, sound design, videos and special effects. And it all came together in an utterly unique performance yesterday. In the immediate aftermath, I wanted to set down my thoughts and feelings about it all, and to share some of the feedback we’ve received. From a personal point of view, yesterday was utterly incredible. I couldn’t be more proud of everyone who was a part of it, and I hope beyond hope that everyone is incredibly proud of themselves and what they achieved too. There were several moments, throughout the day, when I just couldn’t contain myself, and was either leaping up and down and giggling like an idiot, or so overwhelmed with emotion that I stopped conducting and just let the sound wash over me. So many things came together to cause those emotions – sometimes it was the relief when things that had been planned for so long finally came together, sometimes it was delight at how well the marriage of music and images, text and light all created something greater than the sum of its parts – but mostly, it was feeling that human connection with the emotions being felt by the 200+ people on stage. When we all pull together to create something, when we overcome difficulties to achieve a goal we’ve all been striving for – it all just feels so much more worthwhile. It was a joy to share it all with everyone, and I’m humbled by the dedication, support, professionalism and exuberance of this incredible choir. I truly feel that it’s a privilege to work with BeVox – I get such a buzz from it. Toni and I have long believed that the most important thing we can do in life is to create special memories, for as many people as possible. It’s something we aim for personally as well as professionally – for instance, we don’t give each other gifts for our birthdays, we take each other to special places and share experiences instead, as we know these experiences will create memories that will last a lifetime. We still regularly reminisce about what we did for each other’s birthdays a decade ago! We think that this is a fundamental part of what we do with BeVox too – it should be about creating memories together, memories that we can treasure in the years to come. Elemental will live in people’s memories for a very long time, and that is a really special thing. We’ve already had lots of feedback, both from audience members and from singers (and from some singers who were in the audience! ), and it seems that the overwhelming response has been that this was a highly ambitious event, delivered at the highest level. Whilst Toni and I are very proud of our part in that (and we are truly thankful to all the people who have made comments about the work we put it), this was a team effort. No matter how impressive the videos, lighting, staging etc was, no matter how wildly I waved my arms, it wouldn’t have meant anything without the voices and passion of everyone on stage. Because of how technical the show was, it would have been easy to get hung up on the technicalities, and delivered a show that was impressive but that lacked heart. I don’t think anyone could say that Elemental lacked heart – it was dripping with emotion, and that came from the singers. I’d like to thank each and every one of them. Whenever this whole project has felt too hard, whenever we’ve been struggling with the workload or the various challenges that arose (many of which were “behind the scenes” and no-one in the choir knows anything about), we’ve been sustained by a simple truth. We think of the singers of BeVox, and we know that they are sailing right behind us. Thank you. We’ve done virtually all of our Spring concerts now – our big “Sounds of the Sixties” event in Sheffield last Saturday, and our end of season concerts in Lincoln on Monday and Nottingham on Wednesday. We still have Hilton Grange coming up, but I thought now was a good time to look back on the season, and the concerts, and reflect. We’ve had an amount of disruption this season, for one reason or another – different venues, the “Beast from the East” etc. 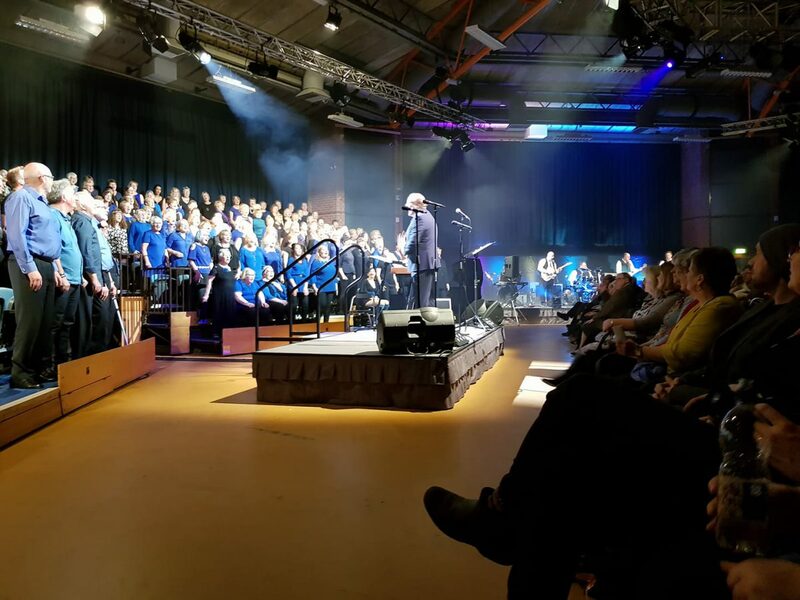 Another choir has started in Nottingham, which has attracted a number of people who have previously sung with us, and this (along with the ongoing parking problems at our venue) has led to quite a fall in numbers – which in turn has worried those people who are still singing with us. The atmosphere in the sessions during the last week of the season was electric. The problems caused by the snow just spurred people on to give it their all, and I was blown away by the energy and vibrancy of the sound. It was huge fun, and I felt privileged to be a part of it. The big concert at The Octagon was an exhilarating experience. The revised schedule made it a very long day – after I started sound-checking with the band at 10:30am, the next chance I got for a break wasn’t until 6:30pm – I didn’t even get to nip to the loo! All the hard work was made so completely worthwhile by the concert itself though – it was such a buzz. There were some real spine-tingling moments, and a real sense of fun too. Some audience members filmed a few bits, so look out for them on YouTube – “Whiter shade of pale” in particular was fantastically good. Dylan, the drummer from The Magic Mushrooms (and my best mate), did a “behind the scenes” vlog too, which is also on YouTube – a good giggle! Bravo to everyone who made the show such fun. Remember – I only wave my arms around – it’s the singers who make the sound, so hats off to every one of you. I hope you’re suitably proud of yourselves. Monday saw us in Lincoln for another blast through this season’s music – a near-capacity crowd was thoroughly entertained by the nearly-hundred-strong choir. The reaction during the interval and afterwards was fantastic – a number of people told me it was the best Lincoln end of season concert we’ve done. We were in a new venue for Wednesday’s event, and we had some very positive comments about it – despite the heating being stuck on! It was so warm, Toni even took her jumper off!! We’ll be certain that they’ve fixed that before we return in the summer. The concert itself went very well indeed – I know a few people were concerned about the voice part balance, but actually it worked very well, and people were very sensitive in their singing as they compensated for the slightly uneven number in each part. At the end of season concerts, we did notice quite a number of people who weren’t quite within the spirit of the BeVox dress code – tops that were more turquoise than blue, or had significant amounts of white trim etc. We have a dress code so that we present a unified look to our audiences. We want everyone to feel like they’re on the same team – but still give enough latitude within the dress code for people to be comfortable with what they’re wearing. We’d like to ask all our singers to remind themselves of our dress code (www.bevox.co.uk/dresscode), and to stick to it for future events. We’re putting the finishing touches to the learning materials for next season’s music, and we’re also hard at work on several other events spread across the rest of this year (and into 2019). We’ll be posting more about some of these soon – especially our “Summer singing day” on 18th August, which will be open to all singers, not just members of BeVox. Watch this space for more info!